The national consensus which had seen President James Monroe elected without opposition to his second term in 1820 was shattered by the contentious election of 1824. Three members of Monroe's cabinet—Secretary of State John Quincy Adams, Secretary of War John Calhoun, and Secretary of the Treasury William Crawford—along with Speaker of the House Henry Clay and General Andrew Jackson, all sought to succeed Monroe. Crawford received the most votes in the caucus of the Democratic Republican members of Congress, but this did not deter the others, all members of the party, from running in the general election. Calhoun dropped out and was nominated for the vice-presidency. Jackson, with 43% of the popular vote, received 99 electoral votes and Adams, with 30% of the popular vote, came in second with 84 electoral votes. Crawford and Clay trailed well behind at third and fourth, respectively, tallying less than half of Adams's electoral vote tally. Since no one had a majority, the 12th Amendment to the Constitution provided that the election would be determined by the House of Representatives, which was constrained in its choice to the three candidates who had received the largest number of electoral votes. Clay, a Kentuckian who was speaker of the House of Representatives, long had been hostile to Jackson, and used his influence to put together a coalition of representatives from sttes in the Ohio Valley and New England to support Adams, who was elected on the first ballot cast in the House. After his inauguration, Adams appointed Clay as Secretary of State. This angered Jackson and his supporters, who charged that a "corrupt bargain" had taken place in exchange for Clay's support of Adams in the vote held in the House. The Jackson forces immediately began their campaign to win the presidency from Adams in 1828, and the cloud over the legitimacy of Adams's presidency, along with his haughty manner and lack of political skills, limited his achievements in office. He proposed a plan to build new roads, canals and other capital projects, but had difficulty in securing support in the Congress. Toward the end of his term, he reluctantly supported a stiff tariff act which the Virginia legislature derided as the "Tariff of Abominations" for its impact in increasing prices for textiles and other basic goods while protecting northern manufacturers from foreign competition. ﻿ Perhaps partly due to the uproar following the 1824 election decided by the House, the 1828 election saw major reform of the election process. Some states started to allow voters, rather than state legislatures, to select presidential electors. Other changes amended voter eligibility requirements to eliminate or reduce property-holding and wealth as a condition of voting, thus greatly expanding the electorate. Aided by these changes and the highly-charged campaign, Jackson won by 647,000 votes to 507,000 and by 178 to 83 in the Electoral College. Over three times as many people cast votes in 1828 as had in the election four years earlier.﻿ After the results were known, the bitterness continued: Adams declined to participate in the Inauguration of his successor. ﻿ From the start of his presidency, Jackson promoted his image as the advocate of the "Common Man." 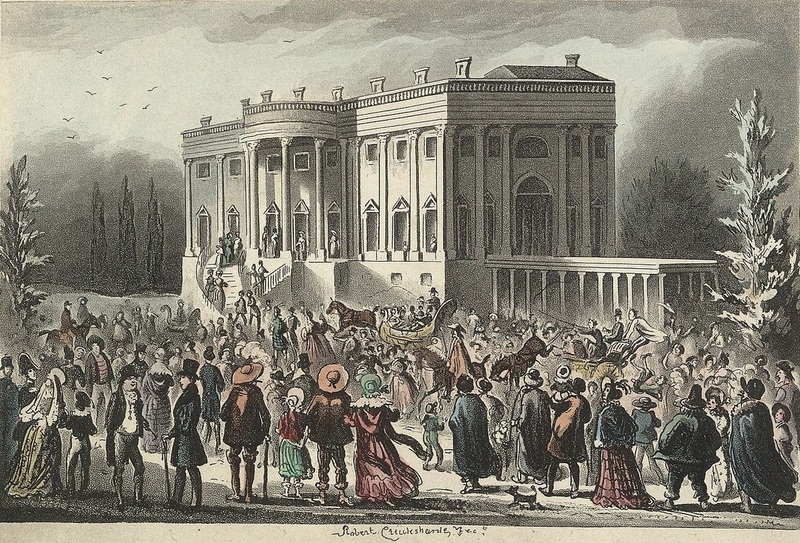 At his Inaugural, he allowed large numbers of citizens into the White House, leading to the destruction of many of its furnishings; to escape the mob, Jackson left the building though a window. In his Inaugural Address, he proposed the abolition of the Electoral College, advocating unsuccessfully for the direct election of presidents and vice presidents. During his two terms, he vetoed more bills than all his predecessors combined, challenging the view that the only grounds for a presidential veto were a bill's constitutionality. He also set the model for political patronage, awarding government jobs which required no special expertise to friends and supporters. In his private life and prior public roles, Jackson's concerns for common men had shown its limitations. While called the first "president of the people," he owned 95 slaves when he took office and 150 by the end of his two terms. In his military career, he had conducted brutal campaigns against Native Americans, killing Indian women and children in Georgia and Alabama after massacres in order to wipe out their villages for cotton plantations and also aggressively invading Florida to punish the Seminoles for harboring fugitive slaves. A year after taking office as president, Jackson signed the Indian Removal Act he had proposed to Congress to force Native Americans to leave their traditional lands to reservations in the west, leading to such episodes as the "Trail of Tears" in which four thousand Cherokees died of cold, hunger, and disease on their way from Tennessee to lands beyond the Mississippi. 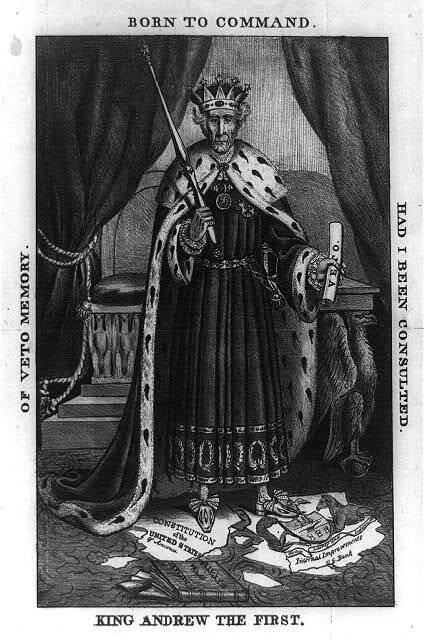 The contemporary two-party system also emerged in the Jacksonian era. When Jackson ran for re-election in 1832, the Democratic Republican Party held the first national convention, replacing the former practice of having a caucus of its Congressional members decide its nominees. An anti-Jackson opposition party--the Whig Party--also soon organized, with many of its members united in criticism of Jackson's populist policies and his imperious style. Jackson's populism also was illustrated in the controversy over the rechartering of The Bank of the United States. 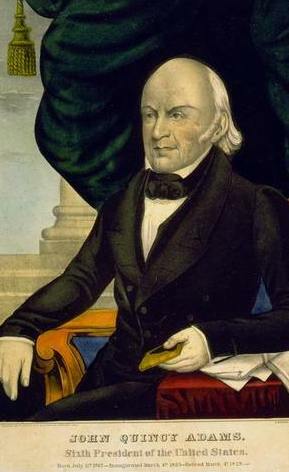 In 1832, four years prior to the expiration of its charter, Nicholas Biddle, the Bank's president, sought legislation to extend the length of the Bank's charter. When Congress passed the bill, Jackson vetoed it, framing the issue primarily in terms of the economic divisions of rich and poor, as well as the resentment toward the high proportion of its stock held by foreigners. His critics suggested, however, that he may have been interested in favoring the emerging New York investment market centered on Wall Street, where some of Jackson's supporters had personal interests, over the Philadelphia banking community, which was the base of the national bank's operations. Jackson's veto of the Bank legislation also led to a request by Senate Whigs for documents relating to the veto; after Jackson refused to comply, the Senate passed a resolution of censure, which was later expunged from the Senate record after Jackson's Democrats gained a Senate majority in the election of 1836. The Eaton Scandal, the "Petticoat War"
The relationship between Jackson and his vice president, John Calhoun of South Carolina, became strained when Calhoun's wife Flordie refused to invite Margaret "Peggy" Eaton, wife of John Eaton, Jackson's Secretary of War who was a close friend of Jackson's and a former senator from Tennessee, to social events. Eaton had defended the honor of Rachel Jackson during the presidential campaign, and Jackson reciprocated when Eaton and his wife became the subject of gossip. The Eatons had married shortly after Peggy Eaton's first husband, a Navy sailor, died by a suspected suicide on a voyage ordered by Secretary of War Eaton, apparently to allow Eaton and Peggy to conduct an affair while her husband was at sea. Although Eaton later resigned from the cabinet, Jackson resented Mrs. Calhoun's social ostracization of Peggy Eaton, and continued to support John Eaton in the face of the scandal, later appointing him governor of the Florida territory. Another major controversy of Jackson's Administration which brought him into conflict with Calhoun related to the constitutional issues on the nature of the federal union presented by the Nullification Crisis. The clash first arose in November 1831 when South Carolina approved an ordinance of nullification declaring that a federal tariff was unconstitutional. The tariff was viewed as favoring Northern manufacturing, which wanted protection from foreign imports, over Southern agriculture, which was heavily dependent on the purchase of foreign goods and the export of its commodities, including cotton, to foreign buyers. To enforce its position, in July 1832, the South Carolina legislature authorized a special convention to sanction the use of its militia to block the collection of the tariff in the state after February 1, 1833. As the potential for violence increased, the President issued a Proclamation in December 1832 declaring the South Carolina nullification act unconstitutional, and setting forth an extensive defense of his view of the federal union that would later be used extensively in the debates leading up to the Civil War. Jackson also dispatched federal troops and warships to South Carolina as the deadline approached. Calhoun then resigned as vice president to return to the Senate to lead his state's arguments against the imposition of federal authority. Violence was averted, however, when Senator Henry Clay and Calhoun, now in the Senate, partnered to draft a reduced tariff agreement that pacified South Carolina while allowing the Federal government to maintain its position that the state could not prevent the enforcement of federal acts. 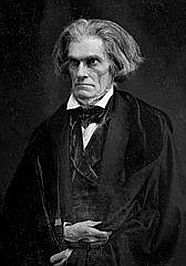 Calhoun would not abandon the concept of nullification, however, and later renewed it in his defense of the South's position on federal intervention over issues related to slavery. Fellow-citizens of the United States! the threat of unhallowed disunion-the names of those, once respected, by whom it is uttered--the array of military force to support it-denote the approach of a crisis in our affairs on which the continuance of our unexampled prosperity, our political existence, and perhaps that of all free governments, may depend. Fellow-citizens of the United States! the threat of unhallowed disunion-the names of those, once respected, by whom it is uttered--the array of military force to support it-denote the approach of a crisis in our affairs on which the continuance of our unexampled prosperity, our political existence, and perhaps that of all free governments, may depend. ....Fellow-citizens! the momentous case is before you. On your undivided support of your government depends the decision of the great question it involves, whether your sacred Union will be preserved, and the blessing it secures to us as one people shall be perpetuated. As he neared the end of his second term, Jackson supported the nomination of Martin Van Buren, his vice president and former secretary of state, to succeed him. Van Buren had successfully formed a political alliance that had helped elect Jackson, and as secretary of state was the only member of the cabinet to back Jackson during the Peggy Eaton scandal. He also had strengthened the Democratic Party, particularly through rewarding its loyalists with patronage appointments. ...My own race is nearly run; advanced age and failing health warn me that before long I must pass beyond the reach of human events and cease to feel the vicissitudes of human affairs. I thank God that my life has been spent in a land of liberty and that He has given me a heart to love my country with the affection of a son. And, filled with gratitude for your constant and unwavering kindness, I bid you a last and affectionate farewell. On the day after Van Buren was inaugurated, he was asked as he took leave of a few friends whether he had any regrets about anything. "Only two," said Jackson. "I regret I was unable to shoot Henry Clay or to hang John C. Calhoun." * The Jacksonian Era: Study Plan >> W.W. Norton & Co.